In a brief, but emotion-filled moment, the Samford University community expressed appreciation Thursday, Feb. 8, to hundreds of university "snow heroes" from the unexpected winter storm that hit Birmingham on Jan. 28 and paralyzed the city for more than 48 hours. 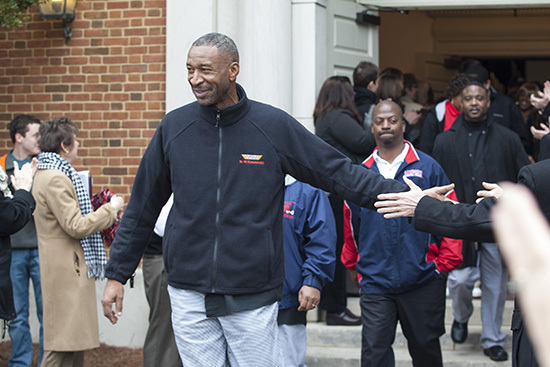 About 120 employees of the university's facilities, food service, housekeeping, bookstore, public safety and residence life staffs filled the Reid Chapel stage as Samford President Andrew Westmoreland recognized them for work across the campus from mid-day Jan. 28 through the following weekend. The university returned to normal operations on Saturday, Feb. 1, and classes resumed on Monday, Feb. 3, after being canceled for four days. Samford's spring semester was barely 24 hours old when more than 1,000 commuter students and employees were stranded on campus for two days until area roadways could be cleared of snow and ice to make travel feasible. The university's emergency response team worked with various campus offices to provide for those who were stranded, along with the more than 2,100 students who live in on-campus residence facilities. "There are lots of folks who worked hard last week to make life more comfortable for all of us," Westmoreland said, "These front-line employees work every day to make our lives better, but we learned last week just how important it is to have people who look out for our needs every day." The hundreds of students and other employees gathered for the regular Thursday morning convocation service gave the "heroes" a sustained ovation, especially when Westmoreland reported that they would be receiving a gift card from the university as an expression of appreciation. The ovation continued as the heroes processed down the center aisle and out of the chapel, where about 50 other faculty and staff members greeted them with more sustained applause. Many of the 'heroes' and many in the crowd had tears in their eyes during the recognition. "We wanted to be able to tell them thanks for all they did last week," Westmoreland said.